Pickup and receive furniture from local upholsters, case good manufacturers, show rooms, private residences, and commercial establishments. Receive merchandise from across the U.S. and around the world. Containers from overseas are welcome. Inspect and detail as required. 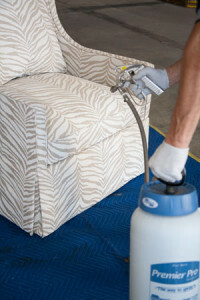 Provide 5 year warranted fabric and leather conditioning. Our standards for employment are high. Before any Delivery Agent is hired, they are interviewed by the immediate manager, as well as by the owner of Diego Delivery. All of our Delivery Agents must posses a valid driver’s license and prove insurability. Diego Delivery is proud to be a drug-free business.